It is hard to remember that Stevenage was once just a small market town astride the Great North Road. Its bus service was provided by the hourly GreenLine, half-hourly 303(A), two-hourly 390 to Hertford via Watton and the irregular 384 between Letchworth and Hertford via the villages. The 1950 timetable shows additional peak-hour 303B journeys to Broomin Green, where the factories were situated. There were no local services, as there was nowhere to serve until 1952 when Bedwell sprang into existence. In 1955-6 the Town Centre site began to be developed, although the first shops did not open until 1958. Many of the early residents of Stevenage were displaced from East London, and with no nearby family or facilities there began to develop a busy flow of travellers back 'home' at the weekend. From 5th October 1955 the Green Line 717 to Welwyn Garden City was renumbered 716A and extended to Stevenage. This route could not be served by Hatfield as the dead mileage would have been excessive, and Hitchin had no space available. 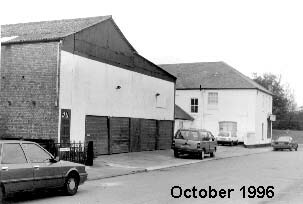 The first Stevenage garage was therefore opened in the former BRS parcels depot at Fishers Green, just out of the 'Old' Town past the railway station. Four RF and two RT vehicles were stationed there on a very cramped site. 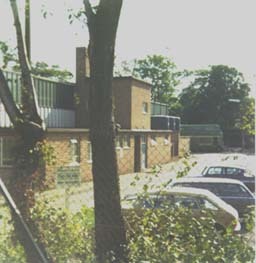 The building survives, in use by a car valeting business. Town Service routes 800 and 801 terminated in the forecourt of the nearby (old) Railway Station, which was just a wide lay-by, until reorganisation in the 1970s. This cramped and unsatisfactory site, with most stock actually out in the yard next to a residential area, was in use for a couple of years before the Town Centre and Bus Station were inaugurated. In 1957 a start was made on the new garage in Danestrete, and it opened for business on 1st May 1959. Hitchin closed its doors at the same time. Initially only RF and RT vehicles were allocated here, augmented by the RMC for Green Line work from January 1963. For some time previously, the prototype RMC4 had worked from here alongside the GreenLine RFs. For a couple of years three XF double-deckers operated the Blue Arrow service, but that experiment did not take off as had been hoped. The Superbus services saw replacement of many Town Service RT vehicles by SM, MS, AN and LN, and the GreenLine RMCs were replaced by RP Reliances from March 1972. By 1973 the varied fleet totalled 53. I am indebted to Nigel Adams for the photographs of Stevenage garage taken in 1974. Even he admits that the quality leaves a lot to be desired, but until a better one surfaces, it will do fine. Note the adapted flying-polo on the pole at the enquiry office, and the LONDON COUNTRY lettering on the long roadside wall. In fairness, Stevenage was one of those classic places where the North aspect was so difficult to photograph that it seldom appears in print. I have seen dozens of photographs of vehicles on the opposite side of the road! Little changed until privatisation under the 1985 Transport Act, when the business based on routes served by garages at Grays, Harlow, Hatfield, Hertford and Stevenage, became London Country (North East) Ltd., a far from viable business, and the very last NBC parcel to be disposed of. Not suprisingly, the company fell into the hands of asset-strippers, in the shape of AJS Holdings, acting in conjunction with Parkdale Holdings who took control of the property. Parkdale sold a lot of the assets for redevelopment before changing its name to Pavilion Leisure and going bust. Within a year London Country (North East) was split into two operations and sold. 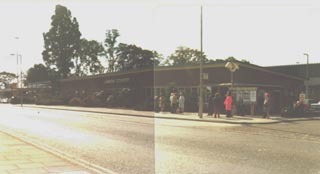 The Stevenage, Hatfield and St.Albans business became Sovereign, who then bought Welwyn Hatfield Line, competitors who had sprung up to exploit the weaknesses of LC(NE). The name of this operating subsidiary was retained until 1995. The majority of Sovereign's Stevenage operation was sold to Luton & District, now Arriva Herts and Essex, in May 1990. Sovereign now operate from Babbage Road on the Stevenage Industrial area, while The Shires set up a base in Norton Green Road. A branch of Kwik Save supermarkets now graces the site in Danestrete.